(York, Pa., July 17, 2018) - York Revolution right-handed pitcher Devan Watts’ contract has been purchased by the Chicago White Sox organization, it was announced today.Watts will report to Advanced-A Winston-Salem in the Carolina League. 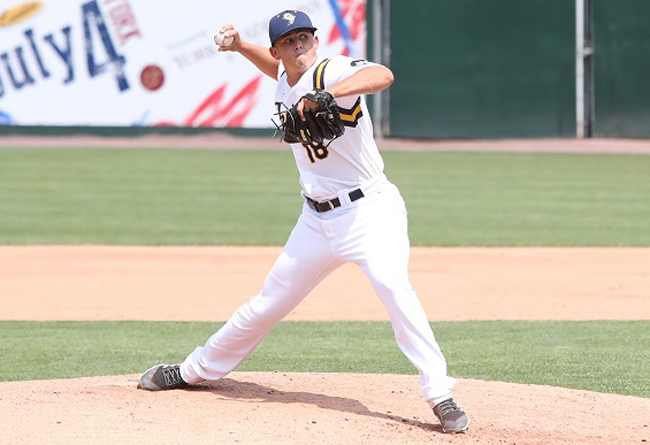 Watts was signed by the Revs on June 18 and made eight appearances out of the bullpen, posting a 2.79 ERA and 10 strikeouts in 9.2 innings. He struck out two batters in three separate appearances, worked more than one inning three times and held opponents to a .222 batting average. Watts allowed just three runs in his eight games and only one run over his final four games, spanning 4.2 innings. "We're extremely happy for Devan," commented Revolution manager Mark Mason. "He came in and worked hard while he was with our club. He earned this opportunity and we wish him the best." The 23-year-old was originally a 17th-round draft pick of the Atlanta Braves in 2016 and reached as high as Double-A Mississippi in 2018 while also spending time at Advanced-A Florida. In 2017, Watts racked up 65 strikeouts in 58.2 innings and had five saves between the two levels. The Mooresville, North Carolina native was 5-5 with a 2.82 ERA over 108.1 innings in 79 games while in the Braves system. Watts becomes the third Rev to have his contract purchased by a Major League organization this season, joining left-handed pitcher Ross Detwiler (Seattle Mariners) and right-handed pitcher Zac Grotz (New York Mets). In other news, the Revs have re-signed catcher and first baseman Isaias Tejeda. One of the Atlantic League's top hitters during his first two seasons with York, Tejeda began the 2018 season in the Mexican League, and returns to York for a third season. The 26-year-old batted .356 with 23 doubles, nine home runs, and 38 RBI in only 65 games during two stints with York in 2016, having had his contract purchased midseason by the Atlanta Braves. His 2016 performance included a 28-game hitting streak, second-longest in club history. Last season, the Santo Domingo, DR native batted .300 with 17 home runs, 78 RBI (5th in Atlantic League), and 33 doubles in 121 games, earning both mid-season and post-season Atlantic League All-Star accolades. His .320 combined average is fifth-highest in Revs history and his .506 slugging percentage ranks 7th. The ninth year pro was originally a New York Yankees farmhand, having spent his first six seasons in the Yankees organization. The York Revolution Professional Baseball Club is a member of the Atlantic League of Professional Baseball. The Revolution were Atlantic League Champions in 2010, 2011, and 2017. The 2018 season is the team’s 12th. Located at 5 Brooks Robinson Way, PeoplesBank Park hosts all 72 home games, in addition to myriad events through the entire calendar year. For tickets or more information, please call 717-801-HITS (4487) or visit the Revolution online at www.YorkRevolution.com.